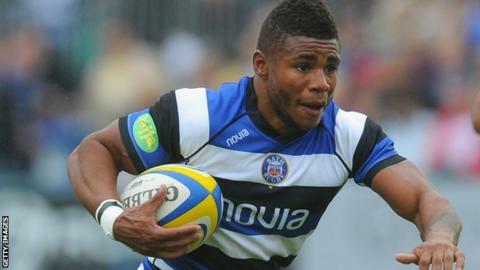 Bath have insisted that Kyle Eastmond will stay with the club despite reports he wants to return to rugby league. An article in the Times claimed the England centre walked out at half-time during Bath's LV Cup win over Sale on 8 November and wanted to quit union. But Bath issued a statement which clarified the 24-year-old's status. "Bath Rugby can confirm that Kyle Eastmond is still in contract with the club and is very much part of the squad," the statement read. "An incident arose at the Sale game last Friday which has led to an internal investigation, but this has been dealt with and both parties have put the matter behind them. Eastmond, who has one year left on his three-year deal at the Recreation Ground, switched codes in 2011 when he left St Helens to join Bath. He played in both of England's Tests against Argentina during their summer tour, scoring a try in their 51-26 victory over the Pumas in Buenos Aries. Bath's chief executive Nick Blofeld confirmed the player has been disciplined following an internal meeting. "The situation is being dealt with," Blofeld told the Times. "Kyle has been disciplined but we are also helping him in what are difficult personal circumstances for him."